AUTOMOTIVE NEWS: Will GMC dealers ever get a vehicle that you can't find in a Chevrolet showroom? MARK REUSS: Absolutely. I think there'll be models that share different architectures and [meet] different market needs than Chevrolet. I'll just leave it at that. It may be a GMC exclusive. 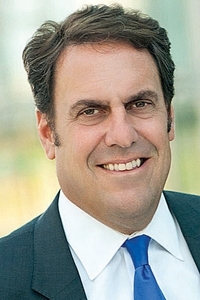 Mark Reuss, General Motors' North America president, says he's not fazed by a decline in GM's U.S. market share this year. He says GM is staying disciplined with lower fleet sales and tame incentives despite a slipping market share, while awaiting a product surge over the next 18 months, including the launch of redesigned pickups and SUVs. Reuss, 48, is trying to change a GM culture that emphasized short-term sales volumes at the expense of residual values and brand image. He's also pressing dealers to raise their customer-service efforts. And he says a stair-step incentive program that Buick and Chevrolet are running through July 2 has been crafted to be fair and effective. Reuss spoke with Editor Jason Stein, Industry Editor James B. Treece and Staff Reporter Mike Colias. Q. Where do you think the year is going to shake out for GM and the industry? A. We upped our industry [forecast] a little bit [on May 1, to 14 to 14.5 million from 13.5 to 14 million previously]. I don't like sitting in here and making excuses. We're focused on launch and what we're going to do over the next year and a half. We're going to turn the portfolio in North America. Everything we do in preparation for that is really sort of a short-term strategy. If we want to go make market share and sell a lot of cars, we know how to do that. Right before we go on and turn the brand-new products, is it really good to destroy all of that to make some monthly thing? No. We're in it for the long haul, and we know what's coming. I'm really, really excited about it. If the market could get to 15 or 15.5 million by the end of next year, are you ready for that? Absolutely. We've got a whole new plant that we're bringing on line with Equinox excess capacity, and that car plant can make a lot of units. It has at one time. If we're at full rates in Spring Hill, we're going to probably do 850,000-plus four-cylinders out of that plant, full song. We're not there yet, but we could. Tires aren't; that's a big one. But our suppliers, I think, are pretty ready. We're sort of a different company, I think, in this way, too: We don't swing production forecasts. We were doing some crazy things. We were calling incentives on a bimonthly basis in the old company, if you can imagine that. What that does to the supply base is you end up getting a break-even point that you never hit because you're constantly toggling it, which is a very destructive business practice. We don't do it ourselves, and we don't do it with our suppliers. I think whatever capacity we say we would like to run, our suppliers are pretty good with it and we stick with it. At the dealer level, selling smaller cars has always been an issue. Are dealers profitable doing it? Do you help them to be profitable doing it? Yeah, we help them to be profitable. [With] the stair-step stuff, you can say we're crafting that so that people aren't disadvantaged selling other things than pickup trucks. We want people to sell and make money at cars. We also want them to redo their stores. We want them to be No. 1 in customer satisfaction and service. In two years, I want to be No. 1. We rang the bell with Cadillac, and now we want to ring the bell with all the brands. What one thing do you think Chevy dealers can do to get there in two years? Using the tools that we have in place effectively to satisfy a customer. We've got a lot of tools, and there are people that don't know all the tools they have in their toolbox to use to satisfy a customer. I don't think it's our dealers. I think it's our district managers and our field staff. We're sort of on a journey to make sure that everybody knows how to do it. We spend a lot of time on our field staff, getting them into the mind-set that it's the No. 1 priority. That I'm going to pay you because of customer satisfaction and service. That's what I'm going to pay you for. We've turned the whole place to that. We're no longer pushing cars and production on you. Your No. 1 job is no longer getting allocation take-up on cars. We don't do any of that anymore. Now what are you going to do? You're going to be a trusted adviser to these dealers. Everybody is assigned a dealer, including myself. We go to that dealer once a month and we enable that dealer. That's what we're doing, and so we've got to get that spread throughout the whole network. Have the roles of zone managers and field reps changed? Have the incentives changed in the way they are compensated? Yes, we did that this year in North America, for this year's compensation. As part of the metric on how we all get paid, including myself -- and this is competitive stuff -- there's X percent on quality. Inside of that is customer retention both in service and sales. That is the ultimate result if we're doing all this right. People come back and buy our cars and trucks. That's a big deal. That's how I changed it. So a zone manager would have money at stake based on the customer satisfaction of his dealerships as well as customer-retention figures? All of it. We've got a dashboard that's pretty clear. And the big-picture reason you're doing that is because something wasn't working the way you wanted it to before? It was a very short-term business model based on pushing cars and sales. This is a long-term deal. I plan on being here for a while and so I refuse to get whip-sawed by the short-term reporting of a month's result. I refuse. That is a monumental shift. For years we talked about where your sales were going to end each month. And you saw that focus on volume filter throughout the culture. We've got to try and make numbers, so I don't get off of that. We're going to have things that we go after. But when we don't make it because we haven't prostituted, destroyed -- call it whatever you want -- the brand, but we've done everything we could in our power to make it with the right tools, then no one's going to be crazy with it. I'm not going to be. So you're saying now that it doesn't matter whether GM employees work in North America on your design staff, as plant managers or as zone reps. Part of their compensation -- if they're at a certain level of the company -- is going to be tied to both vehicle quality and customer satisfaction and retention. Yes. All of them, at any level. The mix will be a bit different on the UAW upside for the folks in our plants, but it's all in there. It was unheard of here. People do what you reward them for. If you look at the way we were set up on a siloed basis, there was an incredible amount of business suboptimization because everybody had their own metrics. Somehow we're all green [indicating each division had met its goals], but weirdly when we added it up, it was pretty red. What's your outlook for Volt sales? Wow, I'm like the 30-day guy [focused on short-term sales] on that one. We've got trucks and everything going out to California to fill it with HOV [high-occupancy vehicles] and then good things will happen. I think it's really turning around, though. It feels good. By June, July-ish, we'll see. Is there anything about the psyche of the Cadillac buyer that seems promising for the ELR electric vehicle? I've had countless people just anecdotally say, "If you ever made a Cadillac one of these, I'd be all over it." How do you eventually see the mix between the Cadillac ELR and Chevy Volt? I really have no idea. What I do know is that we've got a fair amount of Chevrolet and Cadillac dealers that are dualed, which is a good thing. So we don't have maybe the learning curve we had on Volt from a dealer training, explain-how-the-car-works standpoint. Of the GM brands, which is going to win the most market share over the next few years? I don't think about it that way: brandwise. I think about it channelwise because my job is to make sure that we have the right portfolio for our dealers to be profitable, No. 1, and excited and selling. They're only going to do that if we've got the right products for customers. So I don't load anybody unfairly. We make strategic decisions on what we have to do to make sure that whatever showroom we're talking about grows. It really gets down to measuring how well the dealers are doing. That's a pretty good reflection on what we're doing. And, again, how many people come back to buy our stuff. Those are sort of the ultimate things. We'll have the ebbs and flows on market share, and we had holes because of x-y-z, but when we look at the year and we look at the last three years, we've made a lot of money. We've grown market share a little bit, and we will do it again.